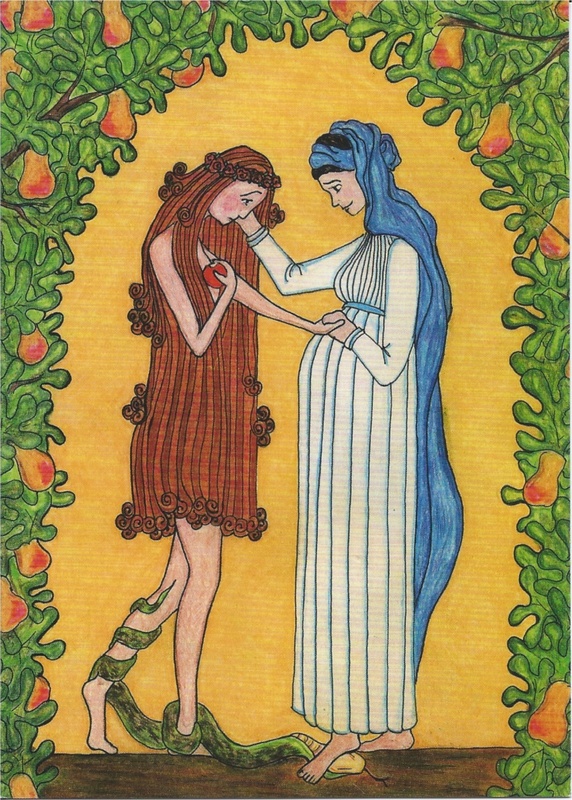 This week we think about the coming of Christmas through the eyes of Mary, as told by St Ephrem the Syrian, a 4th century Doctor of the Church. We examine some of his Nativity Hymns, in a departure from our usual saint segment that typically profiles women saints — after all, he is talking about Mary and he’s a Church Doctor! Our guest today is a cloistered contemplative nun — Sr Grace Remington OCSO, a Cistercian Sister of Our Lady of the Mississippi Abbey, Dubuque, Iowa. Together we discuss the life of a Trappist nun and Sr Grace’s portrait of Mary and Eve (below)… as well as the abbey’s candy-making endeavors!